This 1:670-scale model (no vertical exaggeration) of Barangay Mangin City of Dagupan , Pangasinan Province, Philippines was completed over the period February – July 2009. The model was produced in the context of the Program for Hydro-Meteorological Disaster Mitigation in Secondary Cities in Asia (PROMISE) specifically within the framework of a Community-Based Disaster Risk Reduction (CBDRR) initiative. The project was initiated by a local NGO as part of a larger CBDRR initiative. 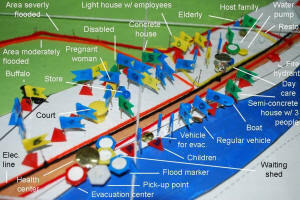 The model features the collective knowledge local residents and representatives from the Barangay, the Disaster Coordinating Council, City Government of Dagupan, Center for Disaster Preparedness, and the University of the Philippines Diliman. 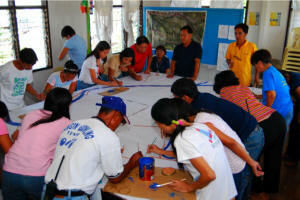 Funding has been provided by USAID and the Asian Disaster Preparedness Center. The 3D model was produced on 4 February 2009 and on 17-18 July 2009 and subsequently used for vulnerability mapping activities. Results includes the following: Spatial assessment of hazard, vulnerabilities and capacities, reinforcement of a CBDRR plan, and methodological learning.